I have always read a lot. My whole work career was built around reading (and writing), and I always read regularly during times I wasn't working. So reading a lot in retirement isn't itself new. However, the way I read has changed in some ways, though not in others. What's different? I no longer have to read for class or for research. So I have a great deal of freedom in what I choose to read. Also, because I don't have a job anymore, I have more time to myself and thus more time to read. So more freedom and time are the main differences. What is the same? I read mostly novels but also (increasingly) non-fiction. I read different kinds of novels, often having a couple going at the same time: one that may be more serious or longer or more difficult, and another (usually read on my Kindle in bed at night) less taxing, such as a detective novel. How do these differences and similarities come together to shape my reading. Here is what I have come up with so far. 1. I read a lot more non-fiction. I often go on "jags," getting interested in something and pushing ahead. Some of my jags have included bog people the search for the Nile, polar exploration, Recently I've been reading a lot of books about World War II, such as the two books I blogged about earlier where someone tried to find out the truth of family artifacts. I then read The Collaborator by Alice Kaplan which is about her search of the archives to narrate the biography of Robert Brassillach who was executed for his writings (rather than actions) by the Provisional DeGaulle government after the fall of Vichy. I am about to start Lost: A Search for Six of the Six Million by Daniel Mendelsohn, about his attempts to discover the truth of what happened to six members of his family who were killed in the Holocaust. The link in this latest jag, I think, is archives, narratives that go back to fill in the past (a narrative shape that I have always found alluring), and World War II. I think my "jags" have to do with wanting to explore a topic (often one I found haphazardly) in more depth and also with the principle of one-thing-leads-to-another. 2. I read novels all the time. Even while on my non-fiction "jags," I always have a novel going. If my serious reading is non-fiction, then my novel is usually pretty easy. But more often than not it is the novel that requires serious attention. I try to alternate long novels with short ones (just to vary the pace) and serious with fun. But I say this in all seriousness (and some of you will know exactly what I mean): I would be a nevous wreck (and no fun to be with) if I didn't have a novel close to hand. My nightmare is to be stuck on a plane without something to read. 5. I still (and will always I believe) have this feeling that reading is "work," as well as "pleasure." Work in the good sense of using my brain and accomplishing something important; pleasure in the sense that it makes me happy and gives me the sense of a larger life. This is a kind of meandering blog post. I feel like I should be able to write something more coherent--something that really illuminates why I read and what it means to me, especially now when, except for a few instances, it not connected to anyone but my retired self. Sometimes I feel like I am in Paradise, being able to wake up in the morning and read anything I want to. Sometimes I feel like I should be doing something else--though I'm not sure why or what that would be. My Life as a Reader. That's probably the best I can do. After a boring first day of driving across Indiana, we entered Michigan for our next two days of the 900 mile drive to our part of the Upper Peninsula: Lake Medora, situated in the Keweenaw, about 5 miles south of Copper Harbor. As our drive progressed, the scenery got wilder, and the season receded. While it was almost summer in Louisville, we saw spring turning backwards as we went north. At the end of Day 2, we crossed the Mackinaw Bridge and were on the Upper Peninsula. Day 3, we headed west and the north, up to the very top of the UP, where everything becomes even wilder and more beautiful still.. Finally comes the drive from Houghton to Lake Medora. And now we are home, waiting for our second spring. Glenn Kurtz. Three Minutes in Poland. More Trails to the Past. Continuing my reading jag. . . . This is a fascinating book. In August 1938, Glenn Kurtz's grandparents went to Europe, visiting famous European cities, such as Paris and Brussels. As part of their trip they also visited a small city in Poland named Nasielsk. While there, his grandfather shot about three minutes of film, both in black and white and in color, of the people of this town. By the next year, all the Jews in this town will have been deported, first to the Warsaw ghetto and then to the camps. Of the town's three thousand Jewish inhabitants, less than 100 survived World War II. Kurts finds this film and recognizes its potential interest. He sends it to the United States Holocaust Memorial Museum, which is able to salvage the film's images. (Just in time, a few years later and it would have deteriorated beyond repair.) Kurtz wonders who these people were. The film is one of the very few home movies made of pre-WWII Poland, and one of the very few in color. Kurtz wants to find out as much as he can about these people, but it isn't until someone sees the movie on the Holocaust Museum's website and sees her grandfather--whose face remains recognizable over 70 years later. Once Kurtz meets the man in the movie, now the 80+ year old man named Maurice (Morrie) Chandler of Florida, Kurtz and Chandler try to name as many of the people in the film as they can. Meeting Morrie, Kurtz begins to find connections and those connections spur further connections. He travels to Canada, the UK, Israel and Poland. He becomes, as he admits, obsessed with documenting as much as he can. But as he eventually recognizes, each connection spins out and the connections almost become infinite. When I first viewed my grandfather's film, I imagined it might still be possible to identify a few of the individuals who appeared in the beautiful color images. But my conversations with survivors quickly spilled over from the frame of the film, from individual identifications into much larger networks. . . . Jewish Nasielsk that exists in memory is the chance artifact of those who happened to live longest." Kurtz recognizes how arbitrary it is that this remembered Nasielsk survived: arbitrary that he found the film in time, arbitrary that someone happened to see it and recognize her father as a child. But even more arbitrary, who survived, who lived long enough to tell the story. Three Minutes in Poland is a glimpse into a lost world and a profound meditation on what makes "history," It is a narrative dream. You can see the move here. Wildman discovers a cache of letters that belonged to her grandfather Karl Wildman. The letters were notable, first because Sarah thought all her grandfather's personal papers had been destroyed, and second because the letters were from a German woman named Valerie (Valy) Scheftel. Valy was the woman Karl left behind when his family emigrated to the US, shortly after Hitler annexed Austria in 1938. Only Valy's letters remain, but it appears that during the course of the correspondence, Karl promised to love Valy and to help her escape. As the years went by, the correspondence became more despearate as Valy's circumstances worsened. 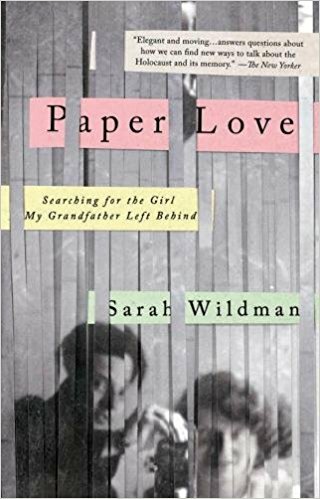 Sarah Wildman sets out to discover as much as she can about Valy and, she hopes her grandfather, who--by the end of the war had married an American woman and began a medical practice in the United States. Sarah Wildman is quite emphatic about how her grandfather's resources were limited--financially (little money and many relatives to support) and logistically (the difficulty of getting exit permits from Germany and entry permits from the US). However, it is Valy with whom Sarah was becomes fascinated. And the book becomes the attempt to find out what happened to her. Sarah Waldman writes for Salon.com where parts of the book are published. Thus she has resources the amateur genealogist lacks. Sarah travels to archives and museums in Europe and the US and visits relatives of people who knew Valy. She is able to get documents translated and to visit sites in Valy's life. The book records to an amazingly detailed degree Valy's life, particularly in the years between 1938 and January 29, 1942 when she was deported to Auschwitz and eventually murdered. Sarah can, in fact, trace her to the very train that carried Valy to the death camp, where the record ends. That is, it's not clear whether she was immediately selected for deathh or died sometime later in the camp. During the course of her research, an important museum at Bad Arolson is finally opened to researchers. It includes lists of names and was initially a sort of clearing house by which people could trace the fate of relatives. As Sarah begins looking at Bad Arolson for traces of Valy, she speaks to one of the major archivists who tells her "It's not a Holy Grail.. . . but it will change the direction of research. "It's not revolutionary--it's not like Hitler's order to kill the Jews. . . . [I]t will become a place of instituionalized memory" (106). Later, he explains that "a list of names takes on a different meaning when it is observed through the eyes of a researcher or someone who knows the history, or through the eyes of someone who wants to understand the dynamics among populations, or what brought survival rather than death" (110). In other wourds, the "lists of names," the "raw data" must be organized, arranged, and interpreted. Thus history becomes not simply a set of names or places but a narrative. In particular, Sarah asks whether the kind of small history she wants to write is important. "Are small stories important?" "Yes," the historian immediately answers: "As historians we can describe what happened, Where it happened. But we can't exactly describe why it happened. [Or as a historical narratologist would say, we need chronicle and plot, a story and discourse.]. The historian cannot describe the suffering of the individuals. Therefore, we need the memorials. We need the letters, the diaries, the the memories of the individuals, As the main part of the picture of what happened" (94). (More on my reading jag to come). From My Window: Watching the Spring Come In. We have been watching spring and the trees coming in through our window. In the middle of all this bursting and blooming, we had a tremendous rainbow, It arched over the building and was at one point almost a double. So hard to take its picture. Now we are pretty much in full green mode. But next week we plan to leave for Michigan, where spring has barely begun. Get to see the leaves come in all over again!